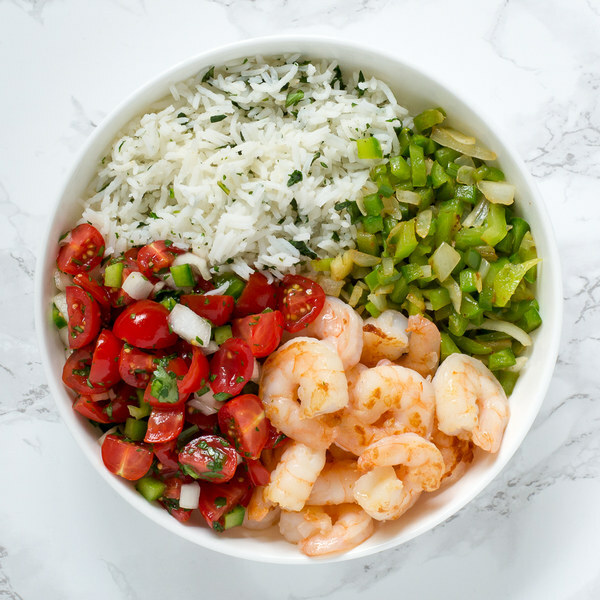 ← Shrimp Burrito Bowl with Cilantro-Lime Rice & Pico de Gallo. Quarter the grape tomatoes and transfer to a medium bowl (that will be used for the salsa). Trim off and discard the ends of the onion and remove the outer layer; small dice the onion into ¼-inch pieces. Transfer one ½ to the salsa bowl and the other ½ to a separate medium bowl. Quarter the bell peppers lengthwise; remove and discard the stem, seeds, and membranes. Small dice the peppers into ¼-inch pieces. Add to the medium bowl with the onion. Juice the limes into a small bowl; add about ½ of the juice to the salsa bowl and save the rest for the rice. Using a knife, shave the cilantro leaves off the stems at a downward angle, working away from your body; discard the stems and finely chop the leaves. Add about ½ of the cilantro to the salsa bowl and add the rest to the bowl with the remaining lime juice. Season the salsa with salt; stir to combine and set aside. Once the skillet is hot, add the shrimp and cook until they are opaque, 1 to 2 minutes per side. Once done, transfer to a bowl and set aside to cool. Once the shrimp has been transferred, add more coconut oil to the skillet followed by the onion and bell peppers. Cook, stirring frequently, until the vegetables are browned and softened, 2 to 3 minutes. Uncover the rice and fluff with a fork. Add the remaining lime juice and cilantro to the rice and stir to combine. To serve, arrange the rice, veggie mixture, shrimp, and salsa in a bowl. Enjoy!